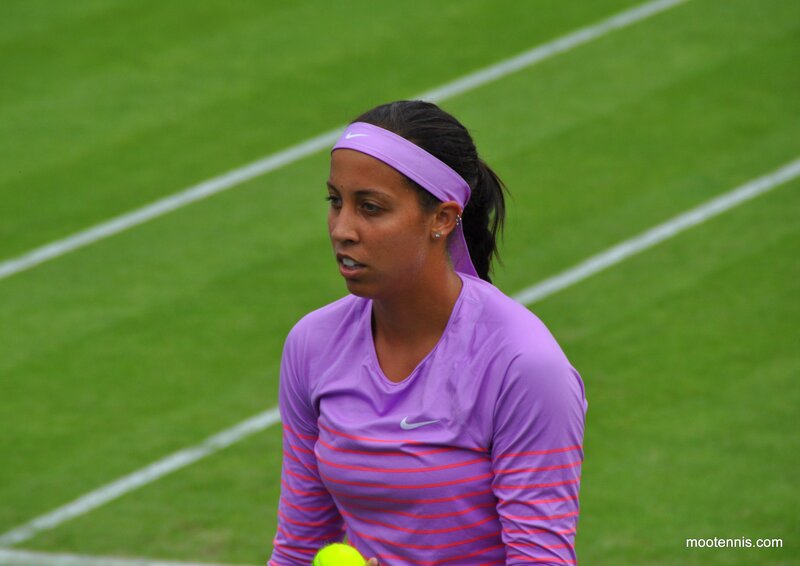 Headlining this year’s Volvo Car Open is Madison Keys who is playing her third tournament back since her comeback from minor wrist surgery. The American endured a tough third round loss in Miami to Lara Arruabarrena, a match where she had many opportunities to win both sets, but likely one that she will be able to build and learn upon. She could face an all-American second rounder against hometown girl, Shelby Rogers. The first seed that Keys could play is Zhang Shuai who gets Misaki Doi in the first round. Doi will be seeking a first win since Dubai having lost her last three matches on tour. She can at least take heart from her last match against Zhang Shuai, a win on clay in Nuremburg in 2015. The other first round match in this section will see Johanna Larsson take on Naomi Osaka. The pair last played in New Haven qualies in 2016 where Larsson won in straights. This is an interesting match-up as Larsson is an excellent clay courter and absorbs pace well against some of the big hitters. As the courts are an in-between of hard courts and traditional red clay courts, I wouldn’t rule Osaka out entirely. 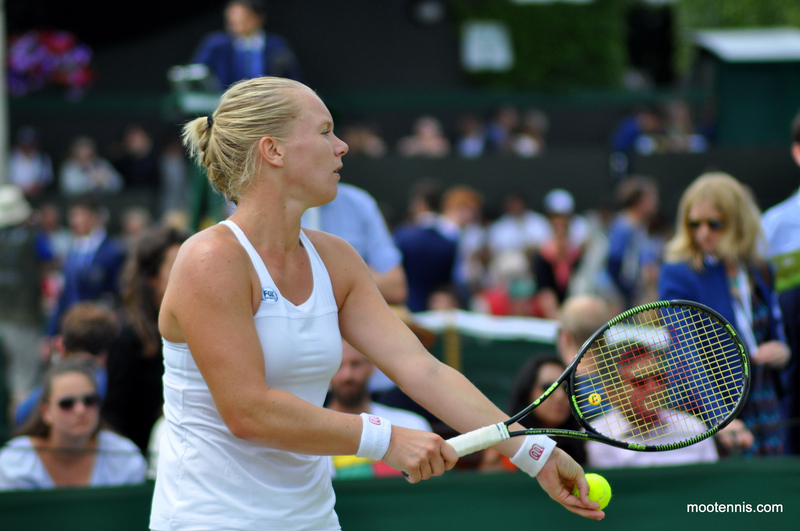 Kiki Bertens has won just two of her last ten matches. A return to clay will be a welcome relief, her best surface, yet looming in the distance is Roland Garros where she will defending semi-final points, which could provide added pressure. First up in Charleston for Bertens will be either Kateryna Bondarenko or Evgeniya Rodina – while Bondarenko leads the head-to-head against Rodina, 2-0, this feels like it has three setter written all over it! Mirjana Lucic-Baroni, with 13 match wins to her name in 2017, is also in this section. If she were to get past a qualifier in the first round, the Croatian player would take on either Mona Barthel or Jennifer Brady in the second round, which sounds like a fun Charleston match-up between two different game styles. After both reached the last 16 of a Slam for the first time in their career at the Australian Open, the pair have had mixed results on tour. Barthel has been stuck in qualifying at three of her four events since Melbourne and made it into the main draw of Indian Wells, while Brady has lost her last three matches including a missed match point against Kirsten Flipkens in her most recent outing in Miami. Elena Vesnina had to qualify for last year’s Charleston tournament – this year, she has a bye into the second round! Vesnina had an astonishing run to the final in 2016, playing eight matches in nine days. This week will be a breeze compared to 2016 and she will open against a qualifier. There are three yet-to-be-determined qualifiers in this section with one of them also due to play Jelena Ostapenko in the first round. The other seed in this eighth is Lauren Davis who opens up against Maria Sakkari in the first round. Davis has had a brilliant year, winning 16 of her 21 matches. Her two most surprising losses have come against American opposition and she lost out to Varvara Lepchenko in Miami. Sakkari will be seeking to get her year back on track having won just one match since a breakthrough third round run at the Australian Open. Caroline Wozniacki makes her comeback in Charleston having skipped the tournament for the past three years. 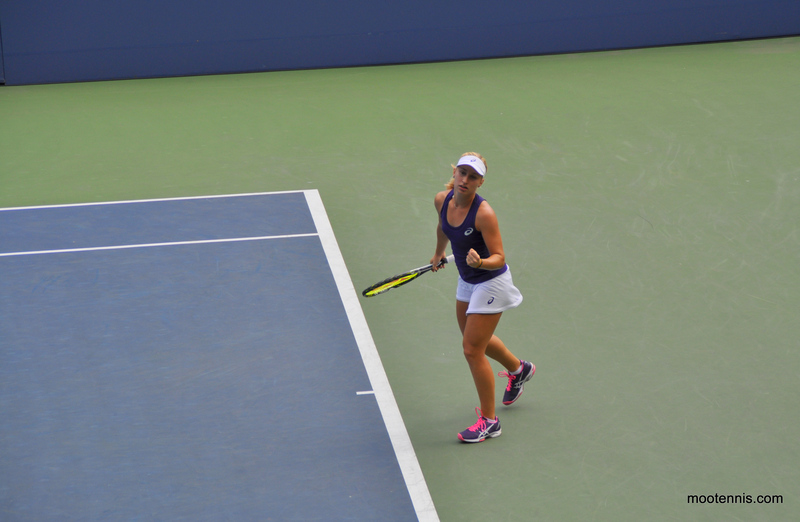 Wozniacki is having a superb year and has played a lot of matches, wreaking the benefits of being fit and healthy. Wozniacki did take a medical time-out during the second set for a foot/ankle complaint. I remember how resilient Wozniacki was in Dubai as she battled through a leg/groin injury so i’d guess she will compete with a couple of days rest. Wozniacki will play Louisa Chirico or Annika Beck in the second round. Chirico has won just one match all year but loves the clay, a surface she came alive on in 2016, reaching the semi-finals of the Premier Mandatory stop in Madrid. Anastasija Sevastova will play Lara Arruabarrena or Andrea Petkovic in the second round of Charleston. Both players have history in Charleston – Arruabarrena pushed Angelique Kerber to a third set tiebreak in a stunning second round match in 2016, while Petkovic is a former champion from 2014 when she defeated Jana Cepelova in the final. Yulia Putintseva is also seeded and has history too, having a great run to the quarter-finals in Charleston last year. Putintseva’s game is well adapted to the clay, yet she will need to show some mental resilience to see off Magda Linette in the first round. Linette leads their head-to-head, 2-0 including a come-from-behind win in Tokyo last year where she saved two match points to win, 4-6 6-3 7-5. It’s lovely to see the commitment from Venus at playing Charleston again, a tournament she clearly loves. The American has been struggling with various ailments in 2017 but that has not held her back one bit – as pointed out by willll in the comments section of the blog, Venus has lost to the champion at her last four tournaments (Serena in Melbourne, Mladenovic in St. Petersburg, Vesnina in IW & Konta in Miami). First up for Venus will be Lesia Tsurenko or Laura Siegemund. The German player has won just one match all year and faces an uphill task to defend some big ranking points coming up including quarter-finals in Charleston. She loves clay though, plus Tsurenko might be a decent opener since the Ukrainian player has been unpredictable this year with injuries/illnesses thwarting her. Venus could be in line for a third round Indian Wells rematch with Lucie Safarova. I’m slightly cursing Lucie’s draw here because I thought she could be a dark horse for the title. I’d still say she is one to follow closely but she’ll do well to reach the last eight as not only does Venus loom, but so does doubles partner, Bethanie Mattek-Sands in the second round. The pair’s last match at Wimbledon was an emotional rollercoaster, one that Safarova won saving three match points. I watched that one live from the stands with bitten fingernails! Of course, I am getting ahead of myself as Safarova will first have to tackle Varvara Lepchenko, while Mattek-Sands plays a qualifier in the first round. 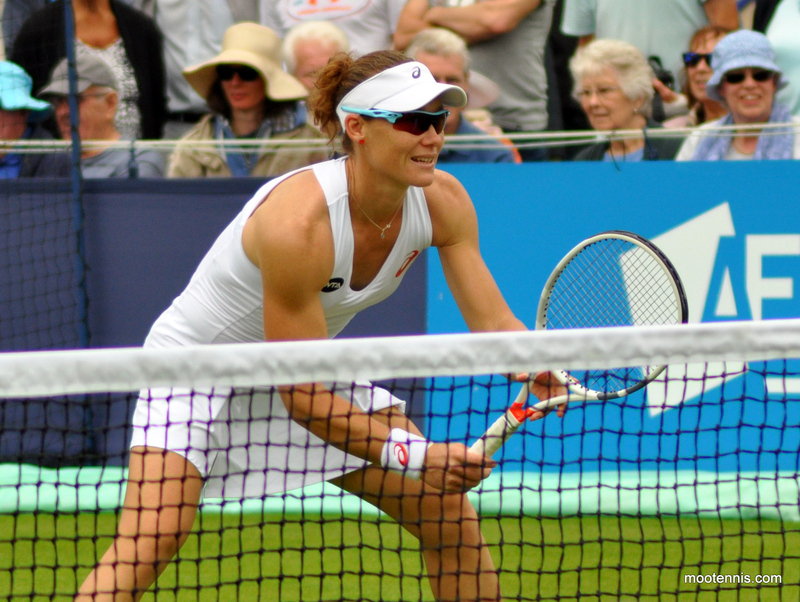 Sam Stosur recently said in an interview at the Miami Open that Charleston was her favourite event on tour. I remember she always used to mention Osaka, Japan but that tournament is sadly no more! Stosur’s first match will be against Jelena Jankovic or Ekaterina Alexandrova – a SS v JJ second round match would likely be a big mess, but one i’d follow with anticipation! 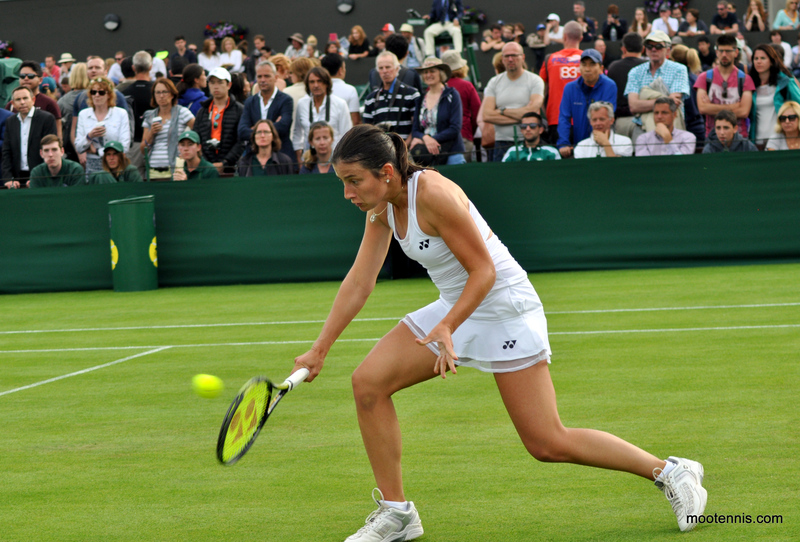 Also in this section are Irina-Camelia Begu, Cagla Buyukakcay, Kristina Kucova and qualifier, Silvia Soler-Espinosa. Begu has a good record in Charleston (see below) and she’ll take on Buyukakcay who is still winless in 2017. 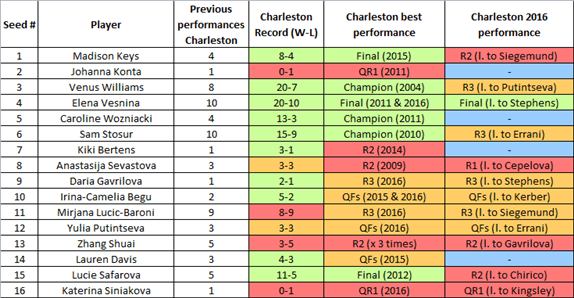 Kucova had a great run in Charleston last year, winning four matches, but has only played once since Melbourne due to injuries. Daria Gavrilova has replaced Johanna Konta in the draw and will receive a bye into the second round where she will play either Alison Riske or Kayla Day. Riske is another player who struggles on clay so this is perhaps a good opportunity for Day to keep impressing. This is my favourite section of the draw with a fascinating quartet of Katerina Siniakova, Monica Puig, Daria Kasatkina and Danka Kovinic. Siniakova and Puig, and Kasatkina and Kovinic will both be first time match-ups on the tour. I’ll pray for the balls in the Siniakova-Puig match, which should be a bruising, ball-bashing affair. I think it should be fun! Kasatkina-Kovinic will be a huge match for both players – Kasatkina has lost her last four matches, while Kovinic has lost her last seven. The pair have both enjoyed previous success in Charleston as former quarter-finalists. Kasatkina was one point away from the semi-finals last year, while Kovinic beat the likes of Naomi Osaka, Christina McHale, Belinda Bencic and Andrea Petkovic to reach the last eight in 2015. Charleston is a tournament that attracts players again and again and again – there are five former champions in the main draw including Venus Williams who won the Charleston title in her very first appearance in Charleston in 2004, beating Conchita Martinez in the final. 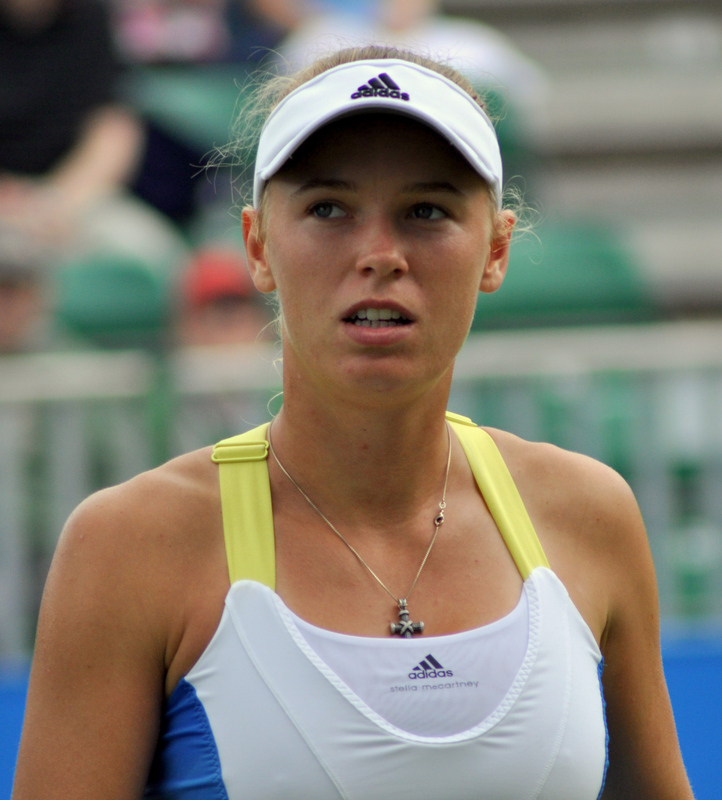 The American has only skipped one year (2015) in the last five; on the other hand, the 2011 champion, Caroline Wozniacki returns to Charleston for the first time since 2013. It’s always been a fruitful tournament for the Dane, never failing to reach the quarter-finals in four previous visits. Madison Keys has had a varied record in Charleston, reaching the final in 2015, but losing her first match in 2016 to Laura Siegemund. Anastasija Sevastova has lost her last three matches in Charleston, while Irina-Camelia Begu may fancy her chances on the green clay – her two previous appearances have ended at the quarter-final stage to the world number one, Angelique Kerber, who has opted to play Monterrey this year. Gearing up for the week in Charleston! Who do you think will win Charleston? Have your say in the tournament poll and as always, comments are appreciated! 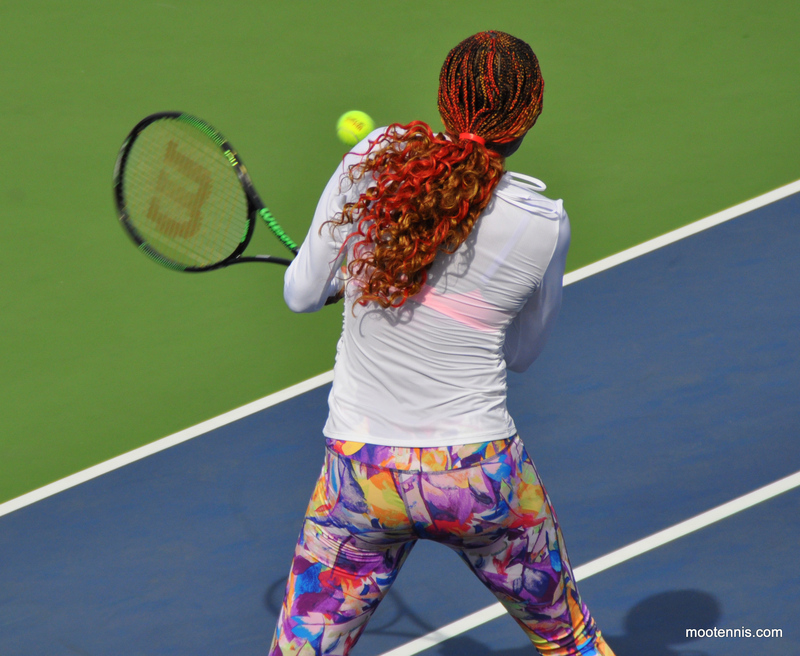 April 2, 2017 in Charleston, Tournament Preview, WTA. This is a difficult one! Vesnina, Keys and Venus would be my picks… but since I can’t choose one I’m going to go for an oddball win from Monica Puig. Yes it is! Felt quite clear in Venus as my champ, hopeful for Lucie to do something but a tough draw on paper. I like Keys to build some momentum, Vesnina should do well & Wozniacki just keeps on winning. Also like Stosur to have a deep run. Hoping that Kasatkina can get some wins this week. I just question whether Venus can physically do it. She’s been very active the past three weeks, even fitter players would be feeling it. Yeah fair point, I still remember that brutal match against Poots in Charleston last year. LMAO are serious? Puig win a tournament?? Dude, she won’t even win the first round. seriously. Yeah it’s not like she won an Olympic Gold or anything, right? Speak for yourself, I have a big respect for what Puig achieved at the Olympics. Perhaps you’d be better investing your energy into learning how to use correct grammar. This is unrelated to the post but a lot of people are saying Aga is anorexic which has contributed to her weight loss and tumble down the rankings. These rumours seem completely unsubstantiated, but I was wondering if you had heard anything. Possibly, but I don’t think so. She’s clearly someone who likes her food – she has an endorsement contract with the Cheesecake Company when she’s in the US, and she’s appeared in videos talking about her favourite pre-match dish (penne alla vodka, apparently) and telling Pat Cash about Polish cuisine including pierogi and soups. Adding to this, i’d not read anything about Aga. I think it’s unfair to even discuss it, if it really is any kind of eating disorder. I have always found her body fat levels far too low, and felt she would benefit from bulking up just a touch. It’s just not healthy being so thin in such a sport. She must have to take in so many carbs during matches to fuel her body because she clearly doesn’t have much stored in her body. Except for Caro and Sam, all of out quarterfinalists are the same! I went for Sarita over Caro and Begu over Sam. I wonder if Begu can turn her season around on her best surface, she has loads of points to defend too come May! Ooo! Errani’s draw looks more favourable now not having to go up against Gavrilova in the first round. Intrigued to see what Begu does on clay this year, she’s had a disappointing start to the year. In Monterrey tournament Naomi Broady hit 17(!!!) aces against CC Bellis and wins 7-6,6-4. A good win for Broady, didn’t expect it to be honest.